Wisconsin senators and representatives who have authored, introduced, co-sponsored, or voted on any of these seven bills would score points on their scorecard ratings which can be found for each house in the menus above. The bills can be found in their entirety by following the links below. Relating to: regulation of persons who sell dogs or operate animal shelters or animal control facilities, granting rule−making authority, making an appropriation, and providing a penalty. 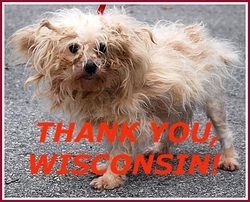 The Dog Breeders Licensure Bill (The Puppy Mill Bill - AB250/SB208) passed unanimously in both houses, was signed by the Governor in late 2009, and is now Wisconsin Act 90. It is the state’s new law regulating dog breeding and will take effect June 1, 2011. This law has been a decade in the making and represents cooperation among many different interests. The intent is to protect the welfare of dogs and to protect consumers who purchase or adopt dogs. The laws are under the jurisdiction of the WI Department of Agriculture and Consumer Protection and that agency will handle the updates, information, and complaints for the new dog laws. Relating to: Regulation of certain dog breeders, granting rule-making authority, making an appropriation, and providing a penalty. 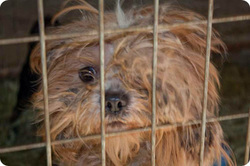 Authors for SB110 and AB250/SB208 collaborated to pass AB250 for puppy mill legislation. Relating to: crimes against animals and providing a penalty. Under this bill, a person who intentionally mistreats an animal or fails to provide an animal for which they are responsible with proper food, water, or shelter, orabandons an animal is guilty of varying degrees of felonies. Permission granted to use picture from link below. Relating to: animals taken into custody. The bill authorizes a political subdivision or contractor that petitions the court for an order with respect to an animal to ask the court to require the owner of the animal to pay funds into the court for the costs of custody and care for the animal pending the outcome of another court proceeding. Custody challenges that have occurred in WI: Thyme and Sage Ranch Overview Richland County, WI - T&S Update & Hoarding Case in Springville, WI. Relating to: slaughter of equine animals. This bill prohibits the slaughter of equine animals (horses and related animals) for human consumption. Relating to: requiring bittering agents in certain engine coolants and antifreeze and providing a penalty. This bill requires that engine coolant or antifreeze that is sold within this state and that contains more than 10 percent ethylene glycol also contain, as a bittering agent, denatonium benzoate in a concentration between 30 and 50 parts per million. How to detect antifreeze poisoning in your pet and consider using new, safer propylene glycol antifreeze, which is less hazardous to animals.